Dawn Farnham is so spirited that it is difficult to pin her down to a single place. 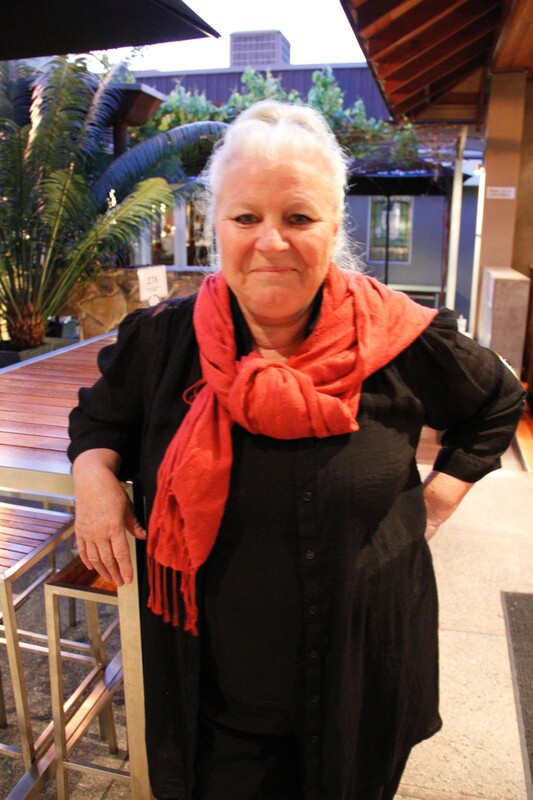 She was born in Portsmouth, England in 1949 but grew up in Perth, Western Australia. In the sixties, she left for England and met and married her journalist husband, Roger, and moved to Paris with him. There she learned French and lots of other things and travelled round Europe in a Volkswagen beetle. As her foreign correspondent husband moved from one exotic location to another, she lived in China, Hong Kong, Korea, Japan and Singapore. She did a B.A. in Japanese at The School of Oriental and African Studies (SOAS) and a Master’s Degree at Kings College. It was in Singapore that she really found the freedom to pursue an old love–writing. She is the author of many successful novels set in Singapore (The Red Thread, The Shallow Seas, The Hills of Singapore, among others). Currently, she is based in Perth. 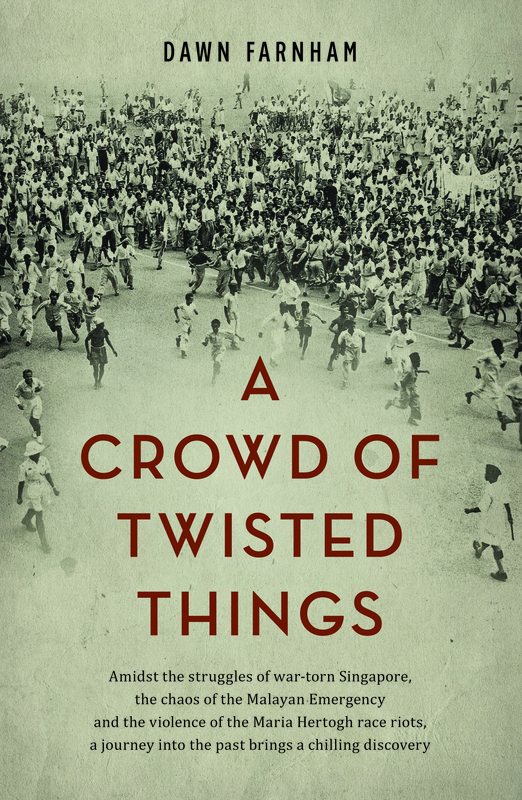 Her latest novel is A Crowd of Twisted Things. This new novel follows the fortunes of young Eurasian, Annie Collins, as she seeks her baby daughter, given away by her murderous Australian husband as the Japanese tanks rolled into Singapore in 1942, and finds much more than she bargained for. Here is an exclusive interview with the author. The Crowd of Twisted Things is set in the Singapore of 1950s and one of themes it pursues is the Maria Hertogh episode and its aftermath. What attracted you to that phase of Singapore history? What inspired you to write this book? I wanted to look at the mess and heartache created by war and its aftermath and the particular experience of women. The Maria Hertogh custody battle and its violent aftermath came at a time when Singapore found itself in one of its most critical periods – rebuilding itself after the occupation, embroiled in the Malayan Emergency and at an unstable political period where new players and ideas were emerging amongst the Chinese and Malay factions but the British still in charge. Dramatic tension is at the heart of all novels so it was an obvious choice on many levels. Around all that I wanted to parallel Maria’s story in Annie Collin’s own search for her lost child. Also I very much wanted to tell the story of women in war – their limited choices, the particular experience that women have in times of violence. We know a lot about men in war but very little about women. Most importantly this novel deals with the stories of many different women – Eurasian, Chinese, Malay, British – as they lived through and after the Occupation. How did you go about the research for your book? How much research do you do for your historical novels as you have written a few of them in the past? I always do a lot of research, much more than appears in any of my novels. Once I have decided on a period and a subject matter, I look for pictures and maps of the time to get a visual feel for the period, then I read as broadly as possible, gradually narrowing reading down to verbatim accounts if they exist, books of memoirs and anecdotes. For A Crowd of Twisted Things, for example, I started with a history of Singapore during and after the war, the Malayan Emergency and so on. Then the memoirs or biographies of men of the time and then, finally, I read all the women’s stories I could gather – there were not that many from Singapore and Southeast Asian in general. Women are quite silent on that time. Three that do exist are Elizabeth Choy’s biography and memoir. Sheila Allen’s ‘A Girl in Changi’ and the harrowing ‘Tears of a Comfort Woman’ about a young girl’s forced prostitution which echoed so many Asian women’s experiences at the hands of the Japanese. Because of the research involved, do you think it is far more difficult to write historical fiction than contemporary fiction? I don’t think it is more or less difficult to write historical or contemporary fiction. Some authors are brilliant at getting the contemporary scene and the prevailing zeitgeist. I find my muse in historical fiction, recreating worlds of the past. For me contemporary fiction writing would be like pulling teeth so it is definitely easier for me to write historical fiction. I enjoy the whole process of research and then pulling the reader into a time they might know nothing about. You were based in Singapore for many years. Now you live in Perth, Australia. How has the move affected you as a writer? I find my geographical location very important to my writing. I have a further completed novel set in Singapore with my agent. I completed that before I left. I have now turned my attention to Australian settings and history. That is the only difference. Except that being around family does take away from writing time but I am quite disciplined and tend to work at night in any case. It is a new challenge to write with Australian settings. I love all kinds of stories from anywhere and about anything so long as they are well-written. In that I’m sure I am no different to any other reader. Dull writing, bad plotting, these are turn-offs. I wasn’t sure I’d like Ha Jin’s ‘War Trash’, but it is so well written, so spare, that I was drawn in. Authors really rather than individual books. From an early age Jane Austen and the Brontes, then later and in particular Joseph Conrad. Also Thackeray, Somerset Maugham, William Golding, Anthony Burgess. For me it is plotting. The act of writing – dialogue, description and so on – I don’t have too much trouble with, but being happy with the unfolding of the plot, that takes a lot of hair-pulling. “Don’t get it right, get it written.” James Thurber, cracking American satirist and writer, said that. It seems to say everything there is about the act of writing. Get it on the page, imperfect, awful, even if you hate it, get it all down all the way from beginning to end. Perfection is impossible in a first draft. Prevarication is the writer’s enemy. Then go back and rewrite, rewrite, rewrite. Surprisingly I am rereading ‘The Secret Garden’ and ‘Anne of Green Gables’, because I’m planning out a children’s book set in Perth at the turn of the century and reading great children’s authors is inspirational. I always have a lot of things on the go. So a children’s book, also working on a screenplay set in Chinatown in Sydney for my agent and plotting out a mystery/drama/love story set in England and Western Australia in 1885. I am one third with my two daughters of Tempest Productions here in Perth and have also just finished a short film script which we plan to film next March. Posted in Authors, Book, Features and tagged A Crowd of Twisted Things, Dawn Farnham, Maria Hertog, Novel, Singapore, The Hills of Singapore, The Red Thread, The Shallow Seas. Bookmark the permalink.